The Beaches have been getting lots of hype over the past year and seeing them at this past Supercrawl in Hamilton made it very clear that the hype was justified. Named after the Toronto neighbourhood where they live, The Beaches are way cooler than I was when I graduated high school. Comprised of sisters Jordan and Kylie Miller, plus their friends Eliza Enman-McDaniel and Leandra Earl. 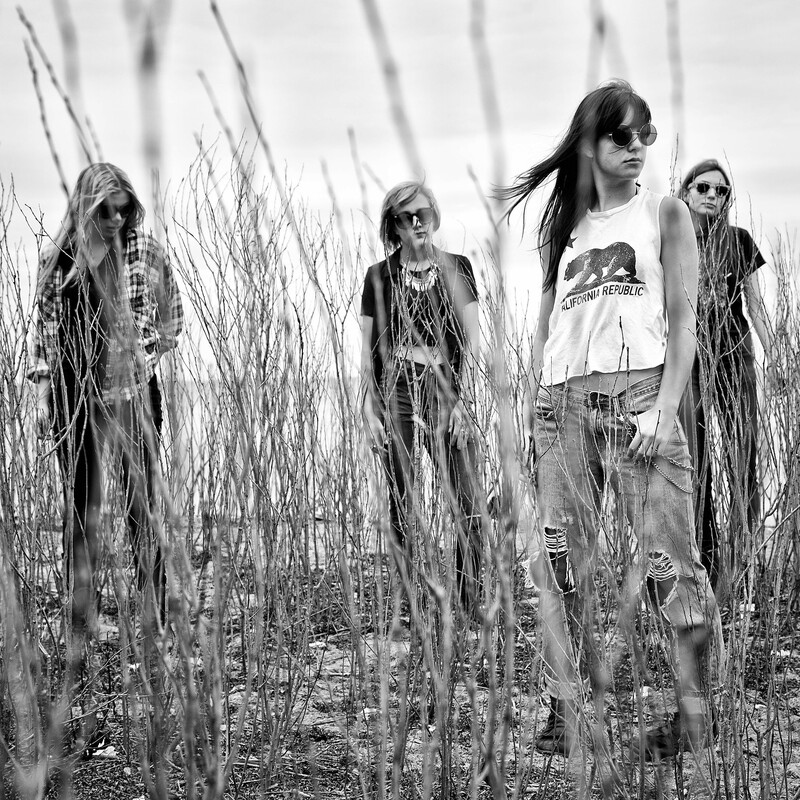 The Beaches are a cool, snarky, addition to the new wave of fem-rock. Also. The Beaches are nice and they seem like really fun girls you might like to hang out with. Q – What’s it like to be too young to get into bars legally, but still able to play at those clubs? Eliza: I guess it’s a little weird, but we’re used to it by now. People give us funny looks when they see us in bars and clubs, but once we get on stage everything changes and they see us in a completely different way. Q – How did you go from the sound you had at Done with Dolls to the current sound you have? Kylie: Our sound has evolved a lot since Done With Dolls. When we were writing songs for DWD we were 12 and 13 years old. As we grew up, our song writing skills improved as other artists influenced us, lyrically and musically. Q – What / who are some of your musical inspirations? Leandra: We’re really inspired by T-Rex, Iggy Pop, David Bowie, Metric, Jack White, and St.Vincent. We love all kinds of music, but it’s always great to listen to an awesome guitar riff or nice low-end moog synths. Q – What’s your approach to song writing? Leandra: We usually jam on an idea that one of us has brought to band practice (Kylie will bring a guitar riff or I will bring a synth riff), and we just layer different parts until it becomes a full song or a skeleton of one. Jordan takes care of all lyrics and vocal melodies, while the rest of us work out the chords and musical parts. Q – How do you feel about being referred to as a ‘girl group’? Jordan: We’d rather be seen as a band rather than a girl band. Q – Are there any female fronted, or fully female groups that you guys look up to? Jordan: Blondie, Savages, Yeah Yeah Yeahs, Garbage, Metric, Haim, and No Doubt are all really cool iconic bands who have definitely inspired us. They each have a really cool style and presence that we have always looked up to. Q – Can you tell us about your most memorable show? Eliza: KOKO in London, England was amazing. I don’t exactly know what happened that night, but we were just so tight as a band, everyone was in the same mind set, and the audience was amazing. We all felt something special at that show that we don’t feel all the time, and it was a pretty cool feeling. Q – What are you guys listening to these days? Can you recommend a track? Leandra: We’ve been listening to a lot of T-Rex and Iggy Pop as glam rock inspirations, as well as Jack White and St.Vincent for dirty guitar riffs and cool synths. We’ve been jamming real hard to My Song 5 by Haim, so I’m gonna recommend that. Q – Where do you hope to be this time next year, musically speaking? Kylie: We hope that next year we will have discovered a concise sound and grown as a band. We are working towards writing a full-length album.